So hungy! Plate that with an ice cold Corona (or Pacifico) and I’m in heaven! This look so delicious, i am so jealous right now. I never thought I would miss seafood as much as I do now. Living in Oklahoma isn’t terrible by any means. I just miss the fresh stuff! Fish tacos are different here. Sushi isn’t the same. Ahhh… I can’t wait till my visit back home in March. I seriously. Cannot. Wait. Ahh I’m hungry now thank goodness for $2 taco Tuesdays! yeah……i love your photo Boss………..so great you take the angle of camera….make the sweet food. This is the Real Thing… Not Taco Bell… ¡Viva México! Nothing like some fresh avo…Yum! Reblogged this on Aquí también, "nosotros los pueblos". One of my favorites! Fresh, easy, and cheap to make! those look fantastic!!! my roommate and I might just have to try and recreate them!! This looks amazing, now I feel hungry!! 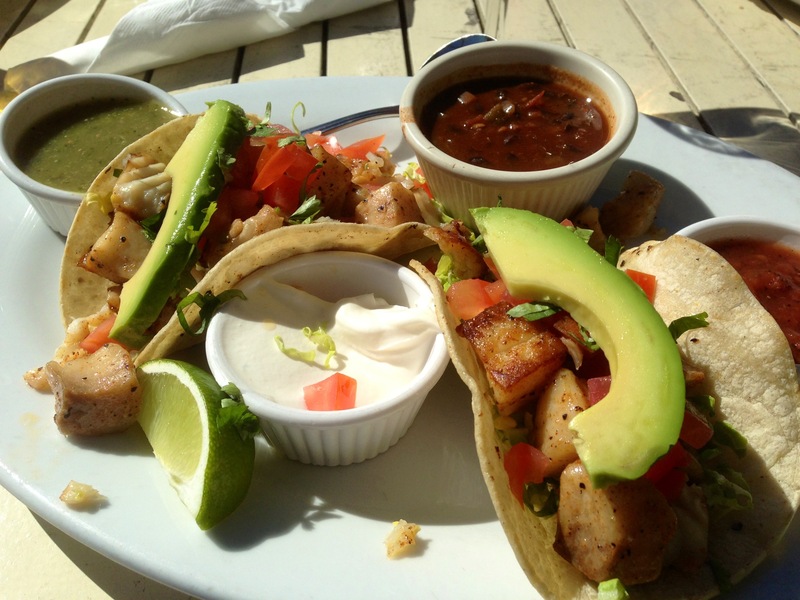 I love tacos, but fish can be such an awesome substitute! Reblogged this on Impactium Cansir. I should write a poem about this! Un homme qui vit très bien… Yum! I didn’t know that was avocado, I thought that was canteloupe, lol! (What type of fish is it-(I like fillet of flounder)! What is the brown/the greenish-brown dip? (I assume the white dip is sour cream; looks like little bits of lettuce; carrot/tomato in the little cup with the sour cream). My cliente would sure love a meal after working! We are in Oregon. YUM I love fish tacos! Add your thoughts here… (optional)Tudo é questão de Ponto de Vista. Quando estamos naquele momento de observação, fazendo uma avaliação de onde conduzir uma sonora, avaliando o contexto do que nos cerca é sem dúvida um momento muito especial, por isso a dica é sempre conhecer o assunto abordado pra que você tenha mais informação do assunto, isto te ajudará a criar mais opções de tomadas. O entrevistado até pode ser nosso personagem principal, devemos tomar muito cuidado ao acertar o local onde será feita a gravação, use seu Ponto de Vista, as vezes vale a pena andar alguns passos até achar mais uma opção, quem sabe ela é que ficara melhor. Tudo depende do seu Ponto de Vista, observe o ponto de vista de desta foto, ficou ótima. Everything is a matter of point of view. When we are at the moment of observation, making an assessment of where conduct a sound, evaluating the context of what surrounds us is undoubtedly a very special moment, so the tip is always to know the subject matter that you have more information on the subject, this will help you to create more options taken. The interviewee to be our main character, we should be very careful when setting the location where you made ​​the recording, use your Viewpoint, sometimes it’s worth walking a few steps to find another option, perhaps it is best that had been . It all depends on your point of view observe the viewpoint of this photo, it was great. Its Works. Lovely colour on the dish, the angle you took the picture. It is very inviting! Bon appetit. I love fish tacos,and one can be sitting on level ground to enjoy them which makes them even tastier!! I love me some fish tacos! anything with avocado is every thing to eat! Looks so yummy! I love fish tacos! My Goodness gracious! … suddenly I`m hungry. Reblogged this on New York's Savior. Right up my alley….yum! Im learning to be more creative…. why do i like edibles this much?